Race to Ratify is a brand new title in the iCivics platform, which is super exciting. What prompted iCivics to add this content coverage to their collection? 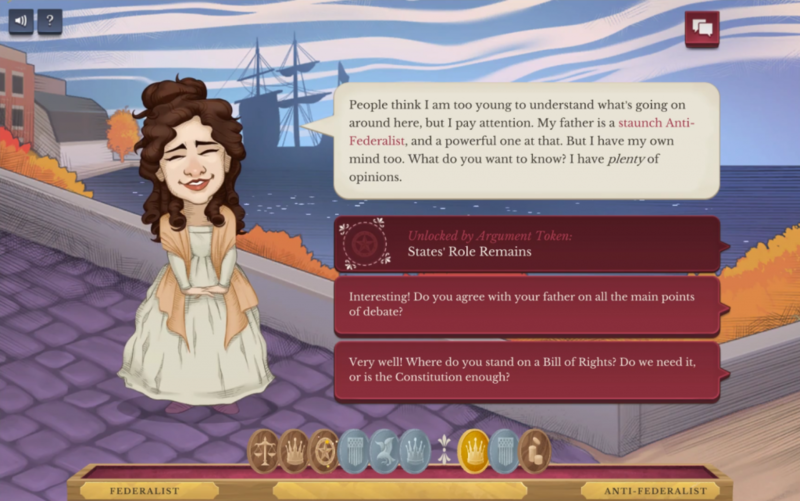 What does it mean for this game to be more of a history-teaching game than other titles from iCivics? So as a former coworker reminded me, I’ve been trying to make this game for 7 years! In terms of adding this title to the iCivics collection, it seems like an obvious fit to me, because I don’t see a gap between history and civics. When you teach civics, a lot of it is history, and when you teach history, a lot of it is civics. So it was a very natural thing to do. We just needed to match up with the right funder to get the ball rolling. (Thanks, National Endowment for the Humanities!) On top of that, almost every History and Civics class starts with the founding. The Federalist Papers and the broader Ratification Debate is a hard thing to teach due to the differences in the language of the period, even though they’re super interesting. 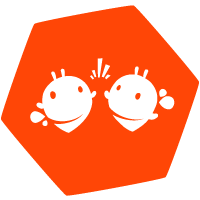 We wanted to give teachers a tool to engage their students and make this learning stickier with this game. Give us an overview of Race to Ratify. How does the game work? How does the gameplay translate into helping learners master the game’s learning objectives? You drop into the heat of the debate in 1787 where you find out that there’s a newfangled plan for government being discussed. You hear a few opinions about it and are prompted to pick a side, whether you lean more pro-constitution (Federalist) or you’re simply not impressed (Anti-Federalist). You are then tasked with becoming a pamphleteer. Once you’ve gained an understanding of each side of the debate, then you go around and tour the country (all 13 states) and hear people’s opinions about whether or not to ratify. Exposure to these opinions unlocks arguments that are found in the Ratification Debate which are delivered in the form of a token. You’re gaining this awareness in an organic setting–a reason why games are an excellent way to learn. You access these big ideas that are taught in the Ratification Debate and then you craftily apply them to your pamphleteering efforts to try and influence the state ratification convention votes. The map of the game has a number of strategic elements regarding where you go, when you go, and what you say when you arrive. Before you get too confident, you discover that you have a competing pamphleteer who is running around and swaying the states away from your position, much to your dismay [sad trombone]. To win the game, players have to either get 9 states to ratify or get 5 states to reject, and don’t think for a second that rejection is the easy way out, because you’d be wrong! All of these different game elements combine to give students a deep understanding of the debate around ratification. Through this identity of the pamphleteer, they get to participate and therefore own the debate in a way that is more immediate and more personal than reading or even essay-writing about these topics. The different points and counterpoints are also delivered in a more atomized way which makes this complex information more digestible. Race to Ratify offers players two distinct game modes – “Historical” and “Free Play.” What are the differences between these modes and the advantages of each? 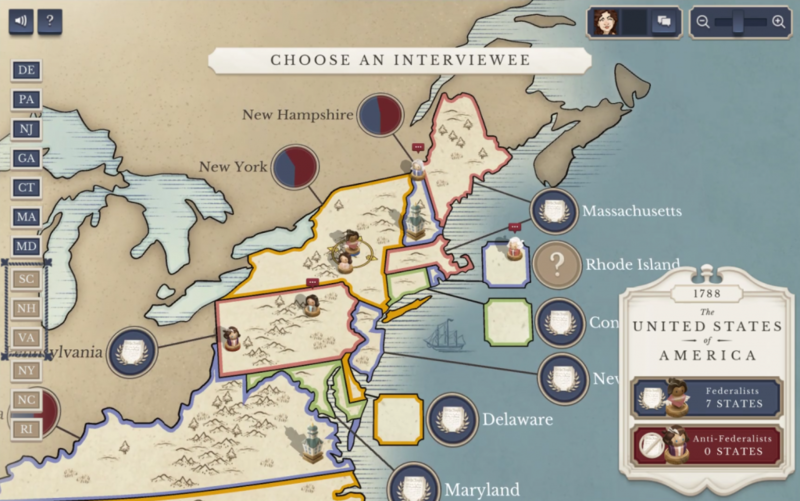 One of the biggest challenges of making a history game is figuring out where you can be historical and nothistorical – to create a game, you need elements like variability and randomness to make the game system work. But history isn’t random! We know exactly how things happened. So the Historical mode provides you with the actual order of the state conventions to inform your schedule and the Free Play mode randomizes the state conventions and the leanings of the states at the beginning of gameplay. For instance – historically, Georgia was an early and enthusiastic ratifier, but in random mode it might be later in the list and more on the fence about ratification. The nice thing about this is that it supports replayability as well, and allows students to approach the debate from multiple angles while still dealing with the same core concepts. Alongside our teams at iCivics and Filament Games, were any additional subject matter experts involved in the making of the game? Yes! We had 10 advisors from universities and organizations across the United States who provided expert insights and resources as we donned the woolen cloak of the late 18th century. They helped a lot, whether it was directing us to the best primary and secondary sources, reviewing the content, or playtesting. Jennifer Rosenfeld, out of George Mason University, was our amazing History Wrangler who helped manage the advisors, conducting the lion’s share of researching the game characters. Incidentally, we made a Race to Ratify History File for teachers to use as reference material when leading students through the game, and you can find that here. It has all of the primary and secondary documents used to create the game, organized by character! What are some of your favorite features of Race to Ratify? My favorite aspect of the game by far is the diversity of people and perspectives represented. One of the most enjoyable challenges in creating this game was to include voices from the many different walks of life that existed in this historical period. Often times when this period is taught, you would think that America was only populated by old rich white men, when in fact there were women, Native Americans, slaves, and free Blacks living amongst the old fellas. And they happened to have opinions about such things as the Constitution. Shocking! The art and UX is also beautiful. The game is just a really fun way to bring history to life, and I’m so pleased that this is our first history game and we were able to cover this period of our nation’s past. Our teams had the exciting opportunity to playtest Race to Ratify during the game’s development with real classrooms in local schools. What was this experience like, and what were folks’ first reactions to playing the game? From my perspective, it was really exciting to see kids not roll their eyes when it was time to learn about the Constitution. I taught civics and history for about 8 years and it’s not traditionally considered engaging content. When it absolutely should be. The team loved watching the kids get flustered when the competing pamphleteer enters the scene, which really speaks to how engaged they were in this narrative. They were talking about concepts like “the power of the executive” to their classmates, which is not a conversation they’d be having otherwise! My big takeaway was at the end, they were comparing scores and one girl said “I didn’t win, but I learned something!” That was really cool to hear. The teacher who ran the playtest wrote at more length about that experience, and had some really amazing insights to share. Read more about that here. Anything else you’d like to add? Also – Team Federalist? Or Anti-Federalist? This is our first branching narrative game, and it was a lot of fun to write. As far as what team I’m on, #showmethebillofrights. Where can folks go to learn more about Race to Ratify?